Detroit's most evil doom band raises hell this Halloween with one of the heaviest, crushing albums ever made! Mixing 70's psych, NWOBHM, 80's doom metal, crust, and death, this album is sure to possess even the holiest by the power of weed, spell and Satanism! 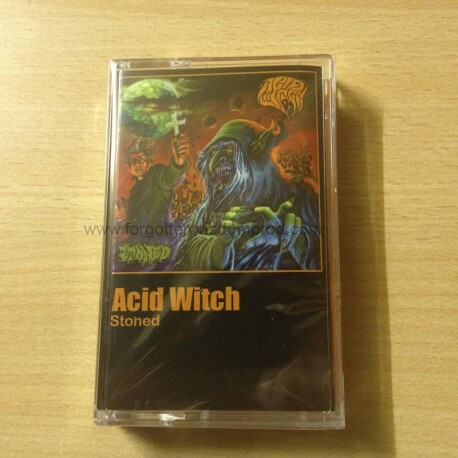 Expect no typical doom metal here eerie listeners, this album isn't just a bunch of recycled Black Sabbath riffs, Acid Witch have crafted their own sound that sounds like no other band now or from the past. Their influences melt together like wax from black candles on an age-old satanic ritual. The production is warm and heavy, yet raw and filthy. All lyrics, art, layout, writing & recording was done by the band themselves, bringing back a punk D.I.Y. attitude the underground is missing nowadays. The Witch is back, and its time to get STONED! Recommended for worshippers of Witchfinder General, Trouble, Deep Purple and Winter.